Hulk mad! Click here to play! Join Bruce Banner on his adventure to escape the clutches of the government that wants to turn him into a military experiment. Banner has transformed into the Hulk and it’s your job to help him avoid getting captured as he battles his enemies. In order to do this, you’ll need to keep a close eye on the Hulk as you spin the reels. His symbol is a wild that will replace all others (excluding scatters and bonuses) to help you create more winning combinations. Also aiding you in your Hulk quest are such symbols as the radioactive symbol, which will payout up to 4000 times your line bet if you can spin two or more across an active payline. There’s also green sludge, military helicopters, and police cars that will create winning combinations if you can spin them across the reels. 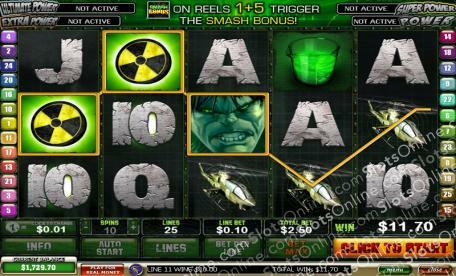 The Incredible Hulk logo is a special scatter symbol that will multiply your total bet by up to 100 if you can get three or more across the reels. It will also trigger a free spin bonus round in which all prizes are tripled. Banner will go into one of his infamous rages if you can trigger the Smash Bonus round by spinning this bonus symbol on selected reels. You’ll have to control the Hulk as he attempts to smash helicopters and police cars in his escape. So, help Banner escape from his enemies and you’ll break the bank in the Incredible Hulk video slot. The Incredible Hulk logo is a scatter symbol that will multiply your total bet if youc an collect three or more anywhere on the board. It will also trigger 10 free games in which payouts are tripled. The Hulk himself is a wild symbol. He only appears on reels 2, 3, and 4, but he will replace all others, excluding scatters and bonuses, to help you bring in more wins. He will also expand down an entire reel if he appears in the center of reel 3 and anywhere on reels 2 and 4. The reel will be held while the others are respun for more chances at a win. The Smash Bonus is triggered by the smash bonus symbol on reels 1 and 5 consecutively. During this bonus round you will be controlling the Hulk as he attempts to smash helicopters and cars. Smash three out of seven cars for bonus cash. Smash one out of three helicopters for multipliers. The Hulk Rage feature is triggered randomly during the Smash Bonus. If triggered, the Hulk will smash all cars and helicopters.